Powerball (also known as "Soccer Shot" at Bodog Games or "Potshot" if you’re playing the ice hockey version) is a simple Pachinko-style game. The aim is to shoot balls from the top of the screen with the hope that they will land in winning buckets at the bottom. In the centre of the game are pegs that the balls can bounce off before falling to the bottom. If a ball falls outside of a bucket, you do not win anything. If a ball is fortunate enough to fall in a winning bucket, you will earn a win multiplier for that particular ball. All in all, Powerball (Potshot or Soccershot, whatever you want to call it) plays like a simplified version of Pachinko. So unless you love playing basic versions of other popular games, Powerball doesn’t quite cut the mustard. Power Ball fun rating - 38%. I just typed in the word "annoying" in to an online thesaurus. A few good results were; frustrating, infuriating and exacerbating, but none of them quite describe the fist-clenching experience that Powerball delivers. The developers of this game have done a fantastic job of creating hundreds upon hundreds of ways for a ball to come precariously close to falling in to a bucket, only to have it hit the edges and fall to the side. 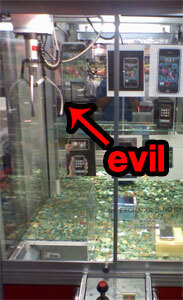 Honestly, the frustration factor rivals that of the worst "claw-grabber" machine down your local arcade. You think you’ve won something, only to have that fluffy, adorable dream to be snatched from you at the last second. If every ball didn’t tease you by barely not falling in to a winning bucket, "Powerball Pachinko" wouldn’t be so bad. However, the fact that it does means that Powerball is comfortably one of the most annoying online real money games that I’ve had the displeasure of playing. On a positive note, the graphics are very crisp and the ball physics prior to the never-falling-into-a-bucket shenanigans are quite good. However, the best graphics and physics in the world aren’t going to stop you from wanting to punch your monitor during a game of Powerball. Powerball, Soccer Shot and Potshot. 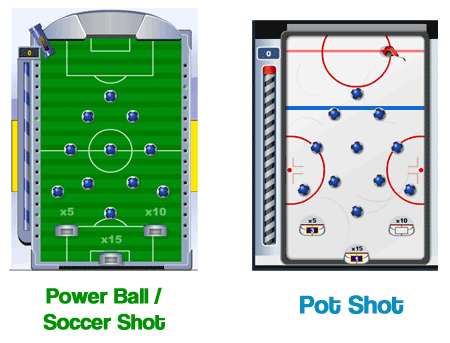 Powerball, Soccer Shot and Potshot are all names for the same sort of game. So I lumped them all in to this one review. Powerball and Soccer Shot. These two games are exactly the same, they just have different names. This is the football or "soccer" version. Potshot. This is the ice hockey version of the game. Potshot uses pucks instead of balls, but they bobble around in exactly the same way. The only difference between these games is the graphics. The different names also depend on where you are playing the game. For example, Bodog calls the soccer version "Soccer Shot", whereas Paddy Power Games calls it "Powerball". Note: I slightly prefer Potshot (the hockey one) thanks to the small animated hockey player firing the pucks across the ice. Petty I know, but whatever. How to play Power Ball. Choose how many balls (or pucks if you’re playing "Potshot") you want to play with and how much you want to wager on each ball. Fire the balls from the top of the screen. Watch them bobble across the pegs and hope that they land in one of the 3 winning buckets at the bottom of the screen. Powerball really is a basic game of Pachinko; a lot like Arcade Hi Lo, but much more annoying. You can play with between 1 and 99 balls in a game. You can wager as little as £0.10 or a ridiculous amount (I don’t think there are actually any limits) on each ball. You can choose from any of the 3 different peg formations. 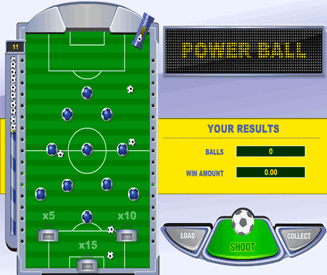 After starting the game, click "Shoot" to fire the balls down the window and in to the pegs. You can fire the balls at whatever rate you like, although balls within the game will not bounce off of each other at all or affect the results. Once all of the balls have been fired the game is over. You can roll over your winnings in to a new game in return for balls (by selecting "load") or your winnings can be collected and saved. It's all about the buckets (payouts). Central bucket - biggest payout (e.g. 15x). Right bucket - second biggest (e.g. 10x). Left bucket - third biggest (e.g. 5x). The payouts for these buckets vary depending on which site you are playing the game of Power Ball at. The above example payouts are the ones used at Paddy Power Games. £0.20 on each ball (for a total wager of £4 in one game). If just one of these balls falls in to a 10x bucket, you will win £2. If other balls fall in to the same bucket or other buckets, they will also add to your winnings. As you can see, if you can get a bunch of balls in to a bunch of high-payout buckets, you will win quite a lot of money in just one game of Power Ball. There are 3 different peg formations that you can play with. Each of these formations are the same in both the ice hockey and football versions. I believe that each of these formations result in the same payouts on average, but there’s no harm in trying them all out. Formation #2 is my personal favourite (there’s a smiley face in it at the bottom).